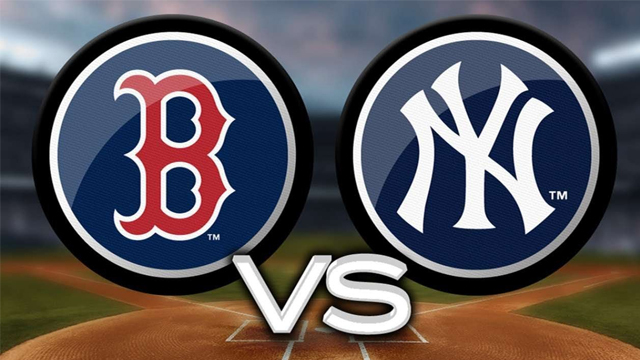 Today the Pawtucket Red Sox and the Scranton Wilkes-Barre RailRiders placed a friendly wager on the outcome of the American League Division series, which will begin tonight at Fenway Park, and mark the first time ever that the Red Sox and Yankees are meeting in the ALDS. They have faced each other three times in the ALCS (1999, 2003, and 2004). During the month of May this season, the PawSox hosted their first-ever "Evil Empire Weekend" after tempers flared between Red Sox reliever Joe Kelly and then Yankee outfielder Tyler Austin, causing a bench-clearing brawl at Fenway Park. When the RailRiders came to town for the first time in 2018, the PawSox admitted fans named Joe or Kelly completely free of charge to the weekend's slate of games, while any fans who self-identified as Tyler or Austin were banned from the premises. In addition, fans who confessed to being named Aaron, Gary, Aroldis, Didi, CC, Jacoby, Masahiro, Giancarlo (or Mike) were charged double the price of a regular ticket. If the Red Sox come out victorious in the ALDS (which all of "PawSox Nation" thinks they will), the RailRiders have agreed to freely admit the first 2,004 Red Sox fans who show up to PNC Park on Tuesday, May 21 (the first time the PawSox travel to Moosic, PA during the 2019 season). Conversely, in the rare and unlikely event New York pulls off an ALDS upset, the PawSox have agreed to freely admit the first 2,003 Yankee fans who show up to McCoy Stadium on Monday, August 26, 2019. Fans must be wearing pinstripes or some type of Yankee paraphernalia to redeem a free ticket, and the same goes for Red Sox fans in attendance at PNC Park who are asked to wear their Red Sox gear. In lieu of "Sweet Caroline" in the 8th inning at McCoy Stadium, the PawSox will agree to play Frank Sinatra's "New York, New York" when the RailRiders are in town in July, and Scranton will in turn play "Shipping Up to Boston" by the Dropkick Murphy's in the middle of the 8th inning during Pawtucket's visit in May. If New York does in fact move on to the ALCS, PawSox Front Office members have also agreed to purchase 27 ALDS championship t-shirts and wear them for a day at work, and Scranton's Front Office will luckily only have to purchase 8 ALDS championship t-shirts once Boston clinches and advances. "We're happy to engage in a friendly wager with our counterparts in Scranton/Wilkes-Barre before the ALDS gets underway," said PawSox Director of Communications & Community Relations, Joe Bradlee. "It's a fun way to get our fans excited for another historic playoff matchup. And PawSox fans have special rooting interest as 17 players on Boston's current 25-man playoff roster have spent time in Pawtucket including our famous Killer B's of Betts, Bogaerts, and Bradley, Jr.!" "There is no bigger rivalry in sports than Yankees and Red Sox," stated Josh Olerud, the RailRiders Team President and General Manager. "We are happy to place this bet with Pawtucket in good fun with a rooting interest in mind. With history and the 'Baby Bombers' like Judge, Torres, Sanchez and Andujar on our side, our front office is fully confident in the Yankees moving on to the next round!" In honor of former PawSox great Trot Nixon throwing out tonight's ceremonial first pitch at Fenway Park, the PawSox Foundation will also be making a donation to the American Red Cross to support hurricane relief in the Carolinas.